When I was in college, I was asked to find some books about the Holocaust that one of study abroad groups could read as they traveled to the Czech Republic. I came across so many that I loved but none of them touched me quite like Hana's Suitcase. 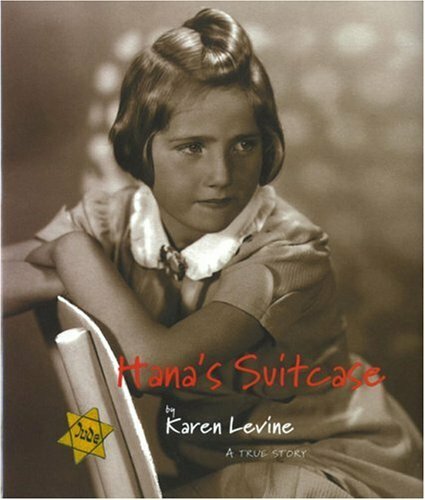 Hana's Suitcase follows the true story of a school teacher in Japan who has begun a Holocaust center in Tokyo. She recieves boxes full of artificats to put in the museum and one of them stands out to her- a suitcase with the name Hana Brady on it. Teh children beg the director of the museum to tell them the story of Hana, but no one has any idea of who she is or what happened to her. Having nothing but the name to go on, the teacher begins an incredible journey of following Hana's story from the beginning and the rest of the story is incredibly moving. The book chapter's alternate between present day Japan and Hana's story. The story is moving and powerful. Hana's story is similar to those of other children who experienced the Holocaust, but the addition of the Japanese school children really brought this book home to me. Their quest to find out about Hana and her family was genuine and passionate. While this story is written for children, I found that adults really get into and appreciate the story as well. It tells the story of the Holocaust without overwhelming the reader at all. This is a quick read and a book that you will not forget for a long time. I recommend the book to as many people as I can and I hope that once you read it, you'll do the same. I think it's interesting how many Holocaust stories are told about the children who experienced it. It adds an element of innocence - innocence stolen, a childhood ripped away from what would have been otherwise spent skipping down streets and playing with friends. I believe telling the a story that involves a child during that time makes the reader connect in a way that they otherwise might not have, because we've ALL been children, and we can all understand what it would have felt like to have looked on the horror of WWII and wonder how the world around us could possibly have gone so bad so quickly.